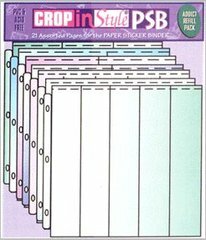 21 Assorted Pages for the Paper/Sticker Binder: 3 Standard Pages - 20 pockets perfect for small stickers and die-cuts. 3 Quarter Pages - 4 pockets for holding larger sized stickers and die-cuts. 3 Wide Border Pages - 2 pockets great for wide border stickers and long die-cuts. 3 Chunky Pages - 5 pockets made medium sized stickers and die-cuts. 3 Standard II Pages - 10 various sized pockets for holding odd shaped stickers and die-cuts. 3 Strip Pages - 5 long pockets for 12" strip stickers and rulers. 12x12 Pages - Safely transport finished pages home from crop parties.